Provider of domestic services Bea Abbot (False Impression, 2015 etc.) suffers domestic problems aplenty when a neighbor knocks his garden wall into her yard. Bea’s property backs two others. One belongs to her fiance, Sir Leon Holland, the other to Adm. Payne and his wife, Lady Edith. Sir Leon’s is vacant during renovations, but the Paynes have a houseful of grandchildren plus Lady Payne’s sister, Mona Barwell, who seems to live in the basement. 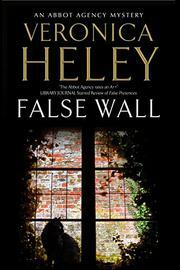 When someone tries to clear the ivy off the Paynes’ back wall, a chain of misfortune follows. Tugging on the roots of the ivy undermines the wall’s mortar, and it breaks apart, sending a shower of bricks onto Bea’s property and toppling a huge sycamore onto her back lawn. Instead of apologizing, the Paynes blame her. They invite her and Sir Leon to a cocktail party, where Lady Edith lures them into deserted parts of the house, drugs them, splashes them with gin, and tries to take incriminating photos. The pair escape but not before someone sets Bea’s house on fire. When she returns from the hospital, Bea finds her agency’s office area destroyed. Sir Leon, who seems to have turned against her, takes off for business in Dubai, where her phone messages are intercepted by Zoe, his personal assistant. Fortunately, her friends come to the rescue. Private detective Hari Silva jawbones jobbers into coming in on Sunday to start restorations, and his wife, Anne, supplies food. Bea’s ex-husband, Piers, moves her parlor furniture upstairs so she can set up an office on the first floor. Computer whiz Keith installs a bank of laptops. Even former lodgers Maggie and Oliver come lend a hand. With all her pals’ to-ing and fro-ing, there’s barely time for Bea to investigate the pile of human bones the police find in Sir Leon’s backyard. Indomitable Bea barely wilts in the face of adversity and even finds time to give the police a hand.